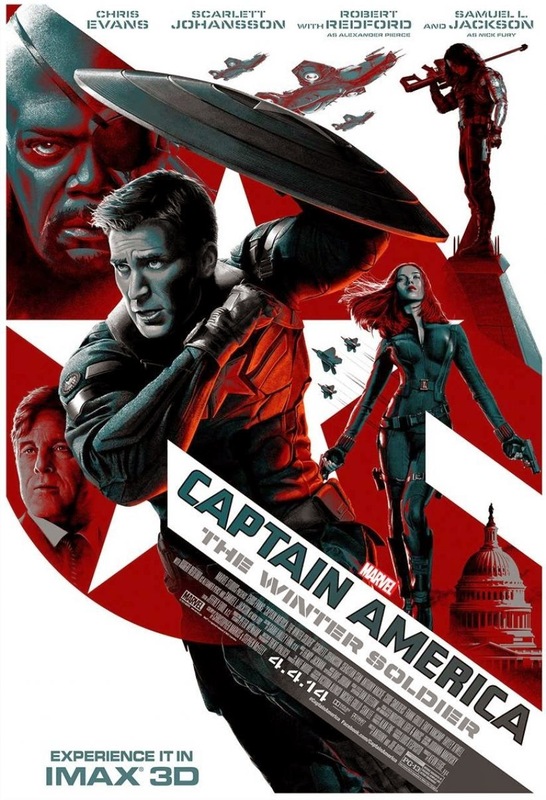 Captain America: The Winter Soldier is the latest installment in Marvel's superhero megafranchise. Chronlogically it takes place after the events of Captain America: The First Avenger, and includes the developments which occurred in The Avengers. 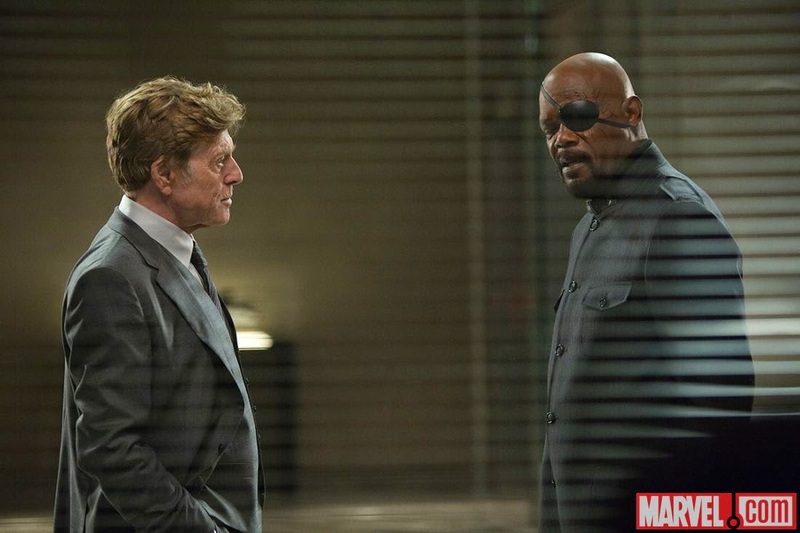 Aside from the eponymous hero Captain America (Chris Evans) and the new villain the Winter Soldier (Sebastian Stan), it also features a new sidekick-type superhero called Falcon (Anthony Mackie) as well as fairly significant screen time for Black Widow (Scarlett Johansson) and Nick Fury (Samuel L. Jackson). There are two ways to watch this movie, and the better is as a comic book action movie first and political thriller second. The Winter Soldier doesn't nearly match The Avengers in terms of the punchy cleverness of its dialogue, but where the writing is perhaps less inspired, the action and intrigue succeed quite well. It opens with a well-choreographed espionage-flavored fight scene to introduce some of the new players and is pretty consistently exciting in terms of pure adrenaline from there to the end of the film. For better or for worse there is quite a lot of action, and the tone ranges from light-hearted to ominous as the Captain's investigations lead him closer to his own past. As a personal journey for our hero it's rather effective, and I imagine anyone heavily invested in the Captain America character will absolutely love this. The movie also functions as a thinly veiled metaphor for contemporary American politics. SHIELD, the stand in for the US government (specifically the NSA), creates a massive surveillance and intelligence network built to identify potential terrorist threats. They then hook this up to a series of autonomous drones which can search for these targets and eliminate them remotely, and it's Captain America's job to eliminate the drones before they become operational. For me, this is the film's greatest strength. American movies which deal with America's national image are often uncritical or even unaware, but this silly little comic book movie manages to question not only the theoretical America within the narrative but metaphorically with the reality of American politics as well. The conflict of the movie arises from the incongruity between our hero's ideals and the reality of American life, and by playing off these two elements the film avoids lapsing into jingoism. Of course, it doesn't take an extraordinarily complex look at the issues, and its idea of resolution is for Captain America to punch the bad guys in the face. While I can appreciate that this achieves more than the average nationalist Hollywood nonsense, it's not by a large margin. My favorite aspect of it may be the political intrigue, but that's not the film's main focus. Its real strength is in its examination of Captain America as a character and using this foundation to invest its audience in some fight scenes. For that reason, the second way to watch this movie—the wrong way—is as an intelligent political thriller first and superhero movie second. The presence of Robert Redford calls to mind classic 70's films like All the President's Men, the story of the discovery of the Watergate scandal and a movie to which The Winter Soldier can't hold a candle. While Redford's presence does lend an air of class to the proceedings, it also highlights how much more comprehensive the film's critique could have been. The Winter Soldier deals with American political issues, but it does so in a peripheral and tangential way as a path to more action and fighting. It's actually remarkably similar to last year's Star Trek Into Darkness in this way: there's a commentary on America's problematic relationship with terrorism, but the movie is ultimately more interested in watching Spock punch Khan than in asking how Peter Weller managed to successfully militarize the Federation or what should be done about it beyond blowing him up. Additionally, the film's run time seems to indicate that it's trying to be more than it is. At two hours fifteen minutes I expect more from a movie than running, punching, shooting, and jumping out of planes, but maybe that's just me. And this movie isn't the only culprit: popcorn action movies have as a genre become longer in recent years likely due to their ability to rake in cash at the box office. The problem is that a movie being too long isn't really enough of a reason to not pay to see it, but allowing films like this to bloat is getting a little out of hand. As Mark Kermode likes to say, 2001: A Space Odyssey took us from the dawn of man to the birth of a new species in just over two and a half hours; if you're significantly passing the two hour mark there ought to be a good reason. At the end of the day, Captain America: The Winter Soldier is a completely acceptable film and maybe one of the best tentacles of Marvel's giant space octopus of a franchise, but there's still plenty of room for improvement. I eagerly await the third Captain America installment, where if all goes according to my plan Steve Rogers will work for The Washington Post.